Plot Summary: In the not too distant future, boxing has become a sport enhanced by “Gear,” machine exoskeletons worn over the shoulders and arms to allow boxers to punch farther and harder than before. 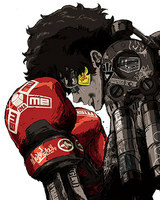 Known as “Megalobox,” the sport is popular as both a regular sporting event and as one during which underground bets are laid, with dramatic differences between the fanbases. Junk Dog, a young Megaloboxer, is struggling both to make a name for himself in the underground fights as well as with whether he's really happy with his current situation. When he hears that the upscale Shirato Group is sponsoring a worldwide Megaloboxing tournament in a special arena, he's largely ambivalent, seeing it as both not worth it and beyond his grasp. But he's getting tired of the rigged fights he's forced to participate in. Then he encounters Yuri, the reigning champ of the sport, and might change his mind.